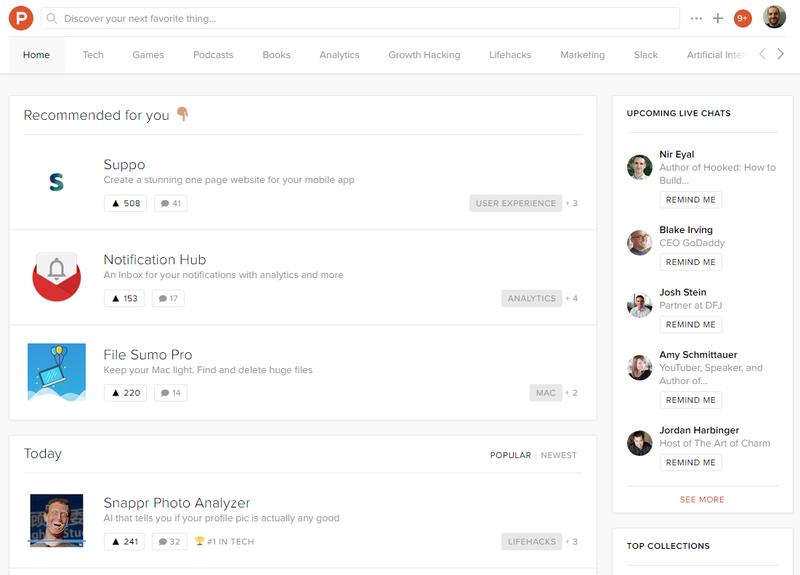 How Are SaaS Getting Featured on Product Hunt? Product Hunt was founded in November in 2013. In three years, it’s become one of the most effective channels for startups to release their new products. It is almost a prerequisite for new SaaS businesses; a rite of passage. Every day, hundreds of products are submitted, but only five make it to the front page. One day after being posted, the five are sent to Product Hunt’s massive email list. There’s no doubt that being featured generates tremendous exposure. There’s no doubt that being featured on Product Hunt = massive exposure. Use this Product Hunt Checklist for an effective campaign. Are you eligible for Product Hunt? Product Hunt is designed to be a bit exclusive. With a standard account, you can upvote products and bookmark them with the collection feature, but you can’t comment on products or submit new products without an invitation from an existing community member. Once you’ve been invited to the community, you are able to submit products. The community encourages people to self-promote by posting products you created yourself. You can submit mobile apps, web apps, physical products, books and resources. You may not submit blog posts, events, news stories, or contract services. Each post requires a name, category designation, tagline, URL, and images of the product. Once your product has been accepted, reply as the first comment with additional information about your product. If you don’t have submission privileges, you could submit a product through someone who does. You would either have to ask someone you know to submit your product, or cold email someone who has submitted similar products. This has the benefit of sending your product straight to the “featured” page, skipping right past the “upcoming” section. If you decide to use a proxy poster, their followers will get an email when they submit your product. Approach potential submitters with as many followers as possible. Moderators typically have the most followers. You could also check out Hunter List, a site that identifies Hunters by how successful they’ve been at identifying viral products. Product Hunt prefers that you only submit products that users can use or buy right now, but they do accept some unreleased products. You just need to provide a lot of information about it, including images or video, so people know it actually exists. Only submit new products unless an older product has gone through significant changes. Hundreds of products are submitted to Product Hunt every day. Only a few products can reach the home page. In fact, most products never gain any traction at all. Product Hunt uses an algorithm (it’s largely a secret, so we don’t know for sure how it works) to determine what reaches their home page. It’s assumed that signals from contributors push products to the top. If your product gets lots of upvotes and comments, you’ll rise in their ranking. If your product doesn’t meet their community guidelines, it will be flagged for removal. View your profile page to check on the status of your submissions. So how do you make it to the front page? This should go without saying, but there are plenty of mediocre products that do become popular and make money. Unfortunately, that route doesn’t work on Product Hunt. Product Hunt is used by tech-savvy, SaaS experts who see through poorly made products that don’t offer a lot of value. You won’t get much love from the community unless your product solves real problems. It’s critical that you understand your product inside and out. You should be willing to talk about your product, the industry and your customer for ages. In the comments, you’ll get questions like these, so make sure you have answer ready. How is your product better than Alternative_Product? How do you plan to compete with your competitors? What’s the real value for a business/person? Why is your product priced that way? If you’re serious about doing well on Product Hunt, be available for Hunters. Reply to their questions, thank them for their comments, and add as much value to the conversation as possible. Hunters who feel invested in your product are more likely to upvote it. If you don’t have member access, request commenting privileges by tweeting @ProductHunt. Sign up for Product Hunt Alert so you’re notified of any mentions. Being aware of Product Hunt mentions is important because someone else may post your product without your knowledge (like what happened to RealtimeBoard). If that happens, you want to be aware so you can reply to comments and hopefully get featured. It’s smart to create a page on your site just for Product Hunt traffic. If there’s a signup or email capture on this page, make sure it tags or segments submissions in some way. You want to be able to identify how many accounts, traffic, email signups, or revenue you generated from Product Hunt. It’s also a good idea to create a special offer for this page. Welcome Product Hunt visitors to your site and reward them with a coupon, special privileges, or other freebies. Product Hunt has a large audience outside of the United States. You want to capture as many of them as possible. Post early to maximize the number of people around the world who view your product. Early upvotes are social proof. They make your product seem more credible and foster more upvotes. Furthermore, posts during the middle of the week see a higher number of upvotes and comments. Naturally, you’ll want to tell your current fans about your post via your social media channels and email list. Link to the Product Hunt post, but do not ask for upvotes. Product Hunt policy prohibits direct solicitations for votes. Instead, simply encourage your fans to check out the post. If they like it and want to support you, they’ll upvote. You should also add some type of call to action to your application site-wide. It should notify traffic that you’ve submitted a post to Product Hunt. Again, don’t ask for upvotes, but encourage fans to check it out and leave their feedback. Through Product Hunt, it’s not unusual to pick up thousands of new users. Make sure your technical capabilities are ready for the new stream. You and your team should be available for the entire day to make sure new users are enjoying your product. If they have a positive experience, they’ll be more likely to give you an upvote. More upvotes = more exposure, so consider this work an investment. For more advice, check out Product Hunt’s own pro tips. Use this checklist to maximize the effectiveness of your Product Hunt campaign. A Product Hunt launch isn’t like a standard launch. You don’t have much control. Your job is to create quality assets (images, landing page, explanatory copy, even a video), so start early. Once your product is up, be prepared to respond in the comments and take the conversation to social media or wherever people are discussing it. Don’t be afraid to make changes, either, like how Guru scrapped their entire landing page mid-promotion because of feedback in the Product Hunt comments. With a great product, careful planning, and attentiveness, you can be successful on Product Hunt. Have you ever tried Product Hunt? What was your experience? Let us know on Twitter. Use this checklist to have a successful Product Hunt launch. Subscribe to receive this extra resource.